- What is happening to us? It wasn't very pleasant to see a man's foot holding down a chicken. They say that the way a country treats its animals reflects on the way it treats its people. Example - China!! - human rights issues? I was disappointed to see this picture as I respect the Persian culture and have many Persian friends for the last 20 years. I don't understand the meaning of the picture or to what use it can have? I'm glad you wrote and I'm sorry that you were exposed to the harshness of "Not Without My Daughter"! I saw the movie with my (then) girlfriend, Susan, back when it first came out! We didn't know what type of message or image it contained about Iran but I literally held my head down and ran out of the theater. Susan and I got married in 1996 and she (who is a blonde native of Texas, USA) went to Iran with me for a visit in the Summer of 1997. Susan loved her treatment in Iran by my family and everyone else who came in contact with her, but she can comment to you directly about that. I looked at Farhad's fashion designs. It's nice but where do you think you could wear these clothes? Thanks for publishing the article [from Rah-e Kargar] written by Mr. Babak Moshtagh on homosexual rights in Iran. Homosexuality is a topic that is not discussed much in the Iranian community. We need more education and discussion on this issue. 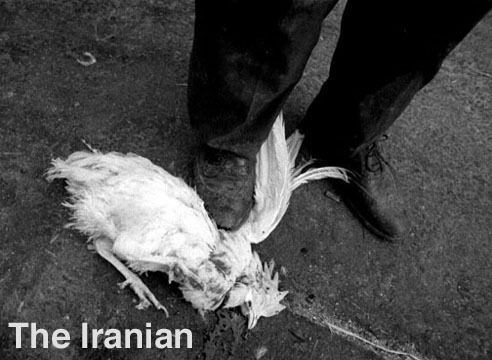 Please consider changing the front-page photo of The Iranian (the foot and the chicken) with something that represents our culture better. I was commented by some Americans on this. Please represent our culture with more respect. How could I have missed all his witty gems until this morning? I thoroughly enjoyed his spot-on observations and relished the delivery: damet garm, dAyi Hamid. * What is happening to us? It's a sad day today (July 24, 2000). It is enough to take a look at any on-line newspaper to find out why. The headlines say: Ahmad Shamlou died, Bakhtegan lake in Fars province dried out. These are just non-political news which are supposd to help reduce the pressures of every day life. It seems that our country is loosing everything at the same time, Freedom left us long time ago and now our natural and cultural resources are going too. What is happening to us? Excellent opening article about the Sherman sanction proposal ["Dumb and dumber"]. I only wished more Iranian and Iraninan-Americans were aware of the efforts you have been putting forth to increase our lobbying force. My name is Kelly. I'm a 15 year old female from New Jersey. I was watching a movie called Not Without My Daughter tonight and it seriously made me cry! It's based on a true stroy which made it even worse. I suggest that you watch this movie. It's about a American women who is married to a Iranian man. They have a daughter named Matop and the father finally convinces his wife and daughter to go to Iran for a visit. But he lies. It's not a visit. It's to stay! They suffer in Iran for nearly a year after being beaten and all. They re-unite (without the husband) in America on Feb. 9th 1986, after a long suffering journey home. Anyone who has information on Betty and Matop or even their email addresses (I wish to talk to them!) or anything please write to me. The news is that Shamlou is dead, like any other human who has or will ever be on the face of this earth. The truth is that Shamlou was just born into immortality and joined the ranks of Hafez, Rumi, and Saadi ["Shamlu"]. The piece on the IRI's attempts to lure expatriates back to the motherland for whatever service or investment is not new to the Iranian society ["Come back (and be quiet)"]. I read the article: "Separating the killers from the heroes" (by Guy Dinmore, Financial Times, July 15, 2000). Just a short note: The common and popular understanding as presented by Mr. Guy Dinmore in his article, is that the Ismailis with the leadership of Hassan Sabbah were known as "Hashashin" due to their useage of Hashish. From what I have read it seems that this religious community were trying to live their life away from the atrocities as imposed by the Arab Caliphs in Iran, hence their living in a mountaintop community, in seclusion. The word Hashashin at the time meant: the "Herbalists". Herbal medicine has ancient roots in Iran and it is known that in this community the cultivation of different herbs for medicinal purposes was practiced (including Hashish, amongst all the other herbs). Herbal medicine is used to this day in Iran alongside modern medicine. The new sanctions proposed by Congressman Sherman are not fair ["Dumb and dumber", "Due process"]! It is a depressing scene when we have the November Elections in front of us. Who are we to vote for? It seems like the members of both parties (Democrats and Republicans) are competing with each other on punishing Iranians! It is not fair! Why should 70 million people be punished for the decision of a minority (hardliners) in Iran? Hardliners in Iran are losing their credibility and their influence not because of sanctions against Iran but because of the reform movement's non-violent, civilized approach towards starting political chang in Iran. Mr. Sherman's approach toward implimentation of political change in Iran is similar to Iranian hardliners' methods, meaning harsh punishment toward opponents. His action will result in the weakening of Iranian reform movement, worsening of social economic conditions in Iran and starting new anti-Iranian sentiments in the U.S. I always thought Democrats were more progressive than Republicans! how can I defend a party that initiates such actions? Mr. Sherman, as a Democrat and a congressman, should look after the interests of all Iranian-American and not just Jewish ones. I assure you that this is not typical Iranian male behavior ["Typical Iranian male behavior?"]. You answered your own question when you said he is "a very immature young man who happens to be Iranian."